At just about every track where the IBG-PASS Pro Stock tour has been so far this season, there have been two cars that have had more raw speed than anyone else. Those rides have been the #8 of young Cassius Clark and the #24 of New England racing legend Mike Rowe. But raw speed alone does not win races. Luck plays into the equation of victory as well and that’s why the Ed Chapman–owned team of Clark has been to victory lane twice while the SP2 team of Rowe has been shut out of victory lane so far this season. Saturday night at Oxford Plains Speedway (ME), that streak continued with Clark being declared the winner after three 50-lap mini features were run with field inversion after each segment making for some interesting racing to say the least. and jumped into a sizable lead in the beginning of the first 50 lapper. When he got stuck in lapped traffic, a very close knit top five formed on his bumper. Ben Rowe, Johnny Clark, Mike Rowe and Travis Benjamin were all within a stone’s throw of the lead at that point. With 149 (and counting) career victories at Oxford, the elder Rowe knows how to get around the place. He used the outside and then the inside to dispose of his competitors and pulled away to take the first segment win. Cassius Clark ended up fourth. Eventually it did work out for Clark, but there were two more acts of racing drama to come first. Field inversion in segment two shuffled the running order a bit, for most of the middle segment Oxford regular Jeremie Whorff had the best combination of starting position, fast racecar and ability to get through traffic quickly. He led until there were just three to go and Alan Wilson took over the top spot and rolled to victory in act two. Right behind Wilson though was none other than Mike Rowe. Cassius Clark was back in sixth. So Rowe was in the catbird’s seat entering segment three. All of the fast cars would start towards the back, but all Rowe would have to do would be to finish sixth in the final 50 laps and he would be mathematically unbeatable for the overall race win. Act three looked pretty good for Rowe. Corey Williams jumped to a good lead early, but after getting nerfed off the turn three banking in segment two by Kelly Moore, he was out of contention for the big picture win. Contenders Alan Wilson and Donnie Whitten got caught spinning in traffic and Rowe was able to move into sixth before the race was very old. Things were looking pretty good for Rowe, but then his car just shut completely off and coasted to a stop on the track. Electrical gremlins did him in. Which brings up the topic of luck. Cassius Clark made some of his own luck in the race by being patient, yet with the 2004 season, where he was fast almost everywhere without any luck allowing him to score a PASS points win, Clark knows that some things are also out of his control. It would appear that might be the case. Rowe was leading at White Mountain before a lapped car spun him. At Thompson, a flat tire and someone else’s oil left him with two wrecked racecars. A controversial incident last week at Riverside where he made contact with Travis Benjamin while racing for the lead dropped him to the tail end of the field and took away his shot at winning there. All in all, it’s been a tough year to be Mike Rowe. With July’s Banknorth 250 getting closer on the calendar and Rowe being a two-time winner of that race, could that be the race that he has in mind to win? “That could be the one,” said Rowe with a smile on his face for the first time on Saturday night. But Clark didn’t pay much attention to strategy or formats when it came to hitting the track. He just raced every lap of the day to win. Meanwhile, Cassius Clark went from being a longshot to being a contender. Clark took the lead from Williams near the end and left no doubt who would be declared the overall victor. He won the final segment hands down. When the points were tallied, Wilson took second place honors. 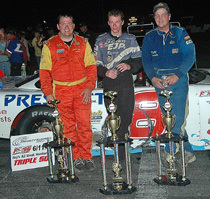 Ben Rowe was third and Mike Rowe had banked enough points for a fourth place finish.